Kalaripayattu is a martial art that also practices traditional Indian methods of healing, leaving its impressions on both war and wound. 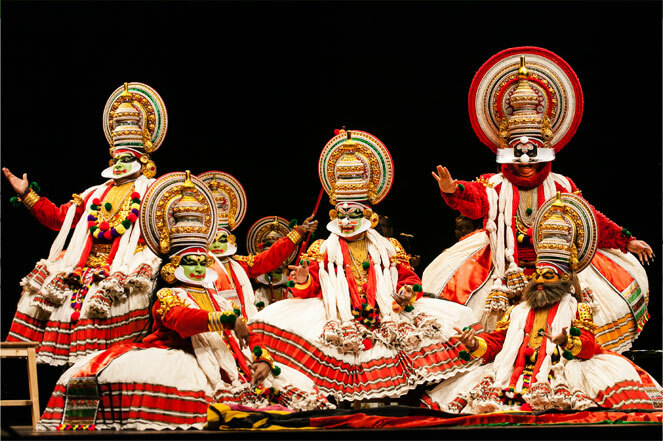 In a more creative way it has also inspired some traditional performing art forms of Kerala, and even travelled east to birth the Kung Fu. Martial arts have existed in India for thousands of years. While there are mentions of fighting and combat in Indian mythology, some earliest records have been traced down in caves of ancient men, who drew battle scenes on walls of their shelters. It has been discovered that the pre-historic man imitated animals for its fighting techniques, fetching inspiration from lions, tigers, elephants, wild boars and even crocodiles. Eventually the fighters also started developing weapons, one of the first being a stick, which acted as an extension of the arm. Various other weapons were invented in the ages that followed. Besides weapons, fighting techniques also took form, eventually being refined to the stage of it becoming a martial art. Kalaripayattu, from the south Indian state of Kerala, is believed to be the oldest martial art in the world, a fact that can be backed by its fighting techniques, which are inspired from those of wild animals. Legend has it that Sage Parasurama, the master of all martial art forms, who developed its techniques, trained warriors in the art form, making them as sharp and supple as animals. The use of weapons followed. “The first weapon students of Kalaripayattu are given is a stick,” says Priyanka Dalal, a beginner level trainee at CVN Kalari, one of the oldest Kalaripayattu schools in India . “Eventually, as they learn to control it, curved sticks, spears, swords, daggers and other weapons are introduced in the training,” she adds. The training of Kalaripayattu involves a rather holistic approach. It aims to help one develop control of their mind and physicality, with the weapons only being an extension of the body and in control of the fighter to achieve high degree of perfection in both offensive and defensive combats. “I find the training to be a rather meditative process, and not at all aggressive – an emotion one would expect from the training of a martial art form,” shares Dalal. “Before beginning the routine, all students kneel and pray to the lords and to the floor of the gymnasium, making it a very spiritual process,” she adds. Kalaripayattu is practiced in an enclosure called kalari, which is 21 feet by 42 feet gymnasium. The kalari houses its guardian deities, who also symbolise the seven strengths or abilities each trainee is expected to have. There are the idols of Vigneswa (strength), Channiga (patience), Vishnu (commanding power), Vadugashcha (posture), Tadaaguru (training), Kali (expression) and Vakasta – purushu (sound). Other deities, most of them incarnations of the Bhagavathi or Shiva, are also installed at different corners. While kalari means place, threshing floor, or battlefield, payattu means exercise or practice. Practitioners of the art devote themselves to learn this challenging form. 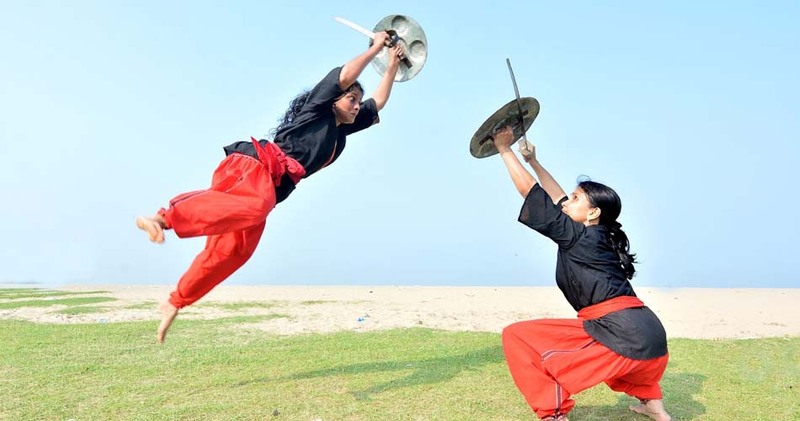 “For the ones, who learn Kalaripayattu traditionally, it becomes their lifestyle, unlike in the western method of learning which ends with a class or session,” says Joy, a physical theatre artist who has had the opportunity to learn the martial art. “The traditional style is also tougher and requires more dedication. It is mostly practiced in the north of Kerala and by fewer people. The style practiced in the south of the state is the one more popular aand practiced now as it has been slightly modified as per urban lifestyles,” Joy shares. The training of Kalaripayattu includes learning the tricks of Ayurveda (ancient Indian medicine and healing system) and in locating the vital points of the body. “In a traditional practice, the art form is passed down through generations and within a family. My gurukkal (Malayali word for teacher) taught it to both his son and daughter, who work with him at the training institute. While the son gives therapeutic massages to men, the daughter takes care of the females,” says Dalal. Kalari has a traditional orthopedic system which is known to help people with displaced bones. “People suffering from rheumatism, a type of arthritis, often come to my teacher’s house, to get cured,” says Dalal. The traditional method of healing includes usage of oils, pastes, herbs to treat muscle and bone injuries. In a Kalari massage the therapist uses his hand and feet, applying pressure on the marma points or the 108 sensitive pressure points in the human body, which are said to hold the prana, or life’s vital energy. Of these 64 are considered as kulamarma or deadly points, which could be used to heel or harm. If these points are pressed hard, it could result in trauma or even death. A kalari masseur uses the marma points to heal. Kalaripayattu has left its impressions on both wound and war. While its medicinal practice heals many, its fighting techniques were once used by warriors from the state. More subtly and creatively, the martial art has also shadowed various performing arts. “Kalaripayattu has had influence on Theyyam and Kathakalli, traditional dance form from Kerala,” says Joy. Both the dance forms were once practiced and preached by the Nair community, which also comprised of the original Kalari fighters. “It can also be seen in contemporary dances, with dancers drawing inspiration from its fighting techniques for their acts,” he adds. It is also believed that the eastern martial art form of Kung Fu hails out of Kalaripayattu. The Indian martial art travelled to China in the 6th century A.D. with Daruma Bodhidarma – an Indian Buddhist monk and a Kalaripayattu master.